I’ve been thinking a lot about organization and cleaning lately. To be honest, keeping the house clean is just not something we’re very good at, and it drives both of us nuts. I always think if I can just figure out a way to make it easier or part of our routine, we might finally conquer the mess. But is it practical for us? Between being at work 50+ hours every week, working completely opposite shifts and in my case a different shift every day, plus blogging, socializing, being generally lazy the rest of the time, would we ever be able to train ourselves to put something like this into practice? I honestly don’t know. I imagine it working for about a week before we lose track, but I’d certainly love to give it a shot and see if we could do it. Andy and I have been trying a few things lately, figuring out how to divide up our chores and work together to get them done. One of the things we’ve realized is that Andy is better at putting things away and I’m happy to get them cleaned. So we’ve decided that I will be in charge of filling the dishwasher and all of the hand-washing, and Andy will be in charge of putting away all of the clean dishes. We’ve been doing this for a few months now and it’s working really well. Where we used to have dishes piling up for days and didn’t have a system in place for who would do them and when, now we stay on top of it almost constantly, and spend less time doing so. What do you think? 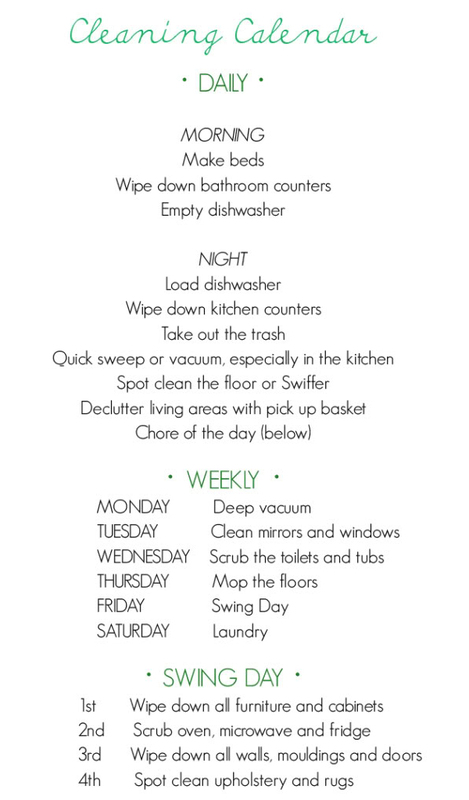 Do you follow any sort of cleaning schedule or have a really good plan that works for you and your family? I would love to hear it in the comments. We need all the help we can get! awesome post! we need to get on a cleaning schedule like this. we have our things we do every day, like dishes and trash, but there are things we let go way too long too, like our bedroom floor. so this is super helpful! I’m “not allowed” to do dishes, because apparently I’m so “bad at it” but we tend to stick to cleaning the things that bug us the most. I hate a dirty bathroom so I’m scouring that at least once a week. He hates dirty floors, so swiffering, mopping, vaccuuming – that’s all him. With a tiny apt. (475 sq ft) we have to pick up after ourselves constantly, or we’d have no space at all!